Pastor Jonathan Conrad (PJ) was born in Statesville, NC, and raised in Winston-Salem, NC. PJ earned his Bachelor’s Degree from North Carolina State University. He worked in radio for ten years at WTOB (Winston), WSJS (Winston), WRBZ (Raleigh), and WPTF (Raleigh). Among his radio duties were producing the local morning and afternoon talk shows, announcing the weekly Trading Post show, and co-hosting a nightly sports show. PJ followed the Holy Spirit to Lutheran Theological Southern Seminary in 1999 and earned his Master of Divinity in 2003. PJ began his ministry as Associate Pastor of St. Michael Lutheran Church (Unionville, PA). He served that congregation for 5 years. During his time at St. Michael, PJ met and married Kristen. The couple were married in August 2007. In 2008, PJ and Kristen moved to Tucson, Arizona, so Kristen could complete an internship for her psychology doctorate. While Kristen continued her education, PJ served three congregations on an interim basis: Lord of Grace Lutheran (Tucson), Streams in the Desert Lutheran (Tucson), and Mountain View Lutheran (Phoenix). PJ was called to Grace Lutheran in August 2009. 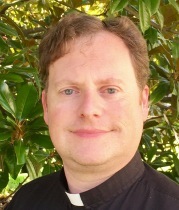 Since he has been at Grace, PJ has not only served the congregation but has acted as President of the Cooperative Community Ministry of Thomasville, President of the Thomasville Rotary Club, Chairperson for the NC Lutheran Synod Convocation, and Chairperson of the NC Lutheran Synod Stewardship Task Force. Currently, PJ is the Chairperson for the Synod’s Campus Ministry Team. PJ loves to read, work out, catch the latest superhero movies, and be the best father and husband he can be.